We are a consulting firm specializing in structural engineering; civil engineering; repair & restoration; construction support, inspection & testing; and surveying. We maintain a highly motivated team of professionals whom through experience, education, dedication, and creativity, are challenged to meet the needs of our clients, our society, and our environment. Ryan Biggs | Clark Davis is licensed to practice in over 25 states and is a certified WBE in New York and Massachusetts. Learn more. Let us put four decades of experience to work for you. Let us give your building the strength to endure. Let us transform your treasures of the past into practical spaces for today. Let us help you uncover a concern before it becomes a problem. Let us conserve the history of your structure for the benefit of future generations. Let us demonstrate how cutting-edge technology can extend the life of your structure. Aside from our five core services, Ryan Biggs | Clark Davis can assist you with various other aspects of your project. The list of professional engineering licenses we hold continues to evolve. Currently we maintain licenses in the following states: AL, CT, DE, FL, GA, IL, IN, KY, ME, MD, MA, MN, NH, NJ, NY, NC, OH, OR, PA, RI, SC, TN, UT, VT, VA, WA, WV, and WI. Ryan Biggs | Clark Davis has fully committed to the transition to Building Information Modeling. The use of 3-D modeling has been a paradigm shift for the industry, bringing design teams together to allow creation and coordination at a heightened level. We are dedicated to staying on the cutting edge of the BIM technology as we begin to blur the lines of traditional delivery methods, merging design and construction, and creating models that will live and transform for the life of the building. 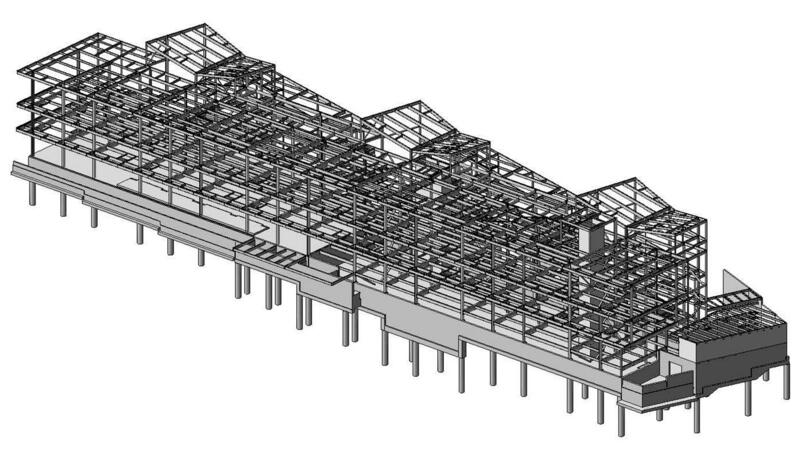 Our BIM Group works off of a Revit platform, and we have collaborated with architectural and mechanical engineering firms on a variety of projects in the healthcare, K-12, and college/university markets. We are currently taking part in the BIM-M Initiative. Several national masonry associations have teamed up to sponsor the Initiative to include materials and systems into BIM software for the AEC industry. As part of the Structural Modeling Group, we will help to establish a roadmap for masonry design including specific projects plans for standardizing masonry unit databases, developing automated 3-D layout of structures, and integrating BIM systems with structural analysis systems and supply chain applications.